Hundreds of displaced Syrians on Saturday returned from Lebanon through al-Zamrani crossing to the area of al-Qalamoun in Damascus Countryside in framework of the efforts exerted by the Syrian Government to restore the normal life to the areas liberated from terrorism by the Syrian Arab Army. SANA delegate at the crossing said that a third batch of displaced Syrians in Lebanon that embraces scores of families, mostly women and children on Saturday noon arrived in al-Zamrani crossing coming from the Lebanese town of Arsal as they were waited by a number of buses to transport them to their villages and towns in Damascus Countryside. 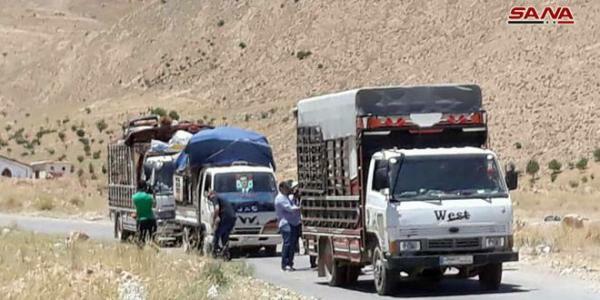 The delegate added that personnel of the Syrian Arab Army received the returnees who had earlier left their houses fleeing from terrorists before the army in cooperation with the allied forces restored security and stability to the area. A number of the returnees expressed thanks for the great sacrifices of the army which restored security and stability to their villages and towns. They called upon all the displaced Syrians due to terrorism to return to their homes and to contribute to rehabilitating what has been destroyed by terrorists.